I love to mix patterns together in a room. I think it gives a space character and interest. I got on a cleaning spree the other day and started going through my fabric stash. I found a piece that I have had for a couple of years and just never used. I thought it was perfect with all the other patterns in the family room, so of course I had to make another pillow. When I redid my family room I used some plaid and chevron patterns with the checks. 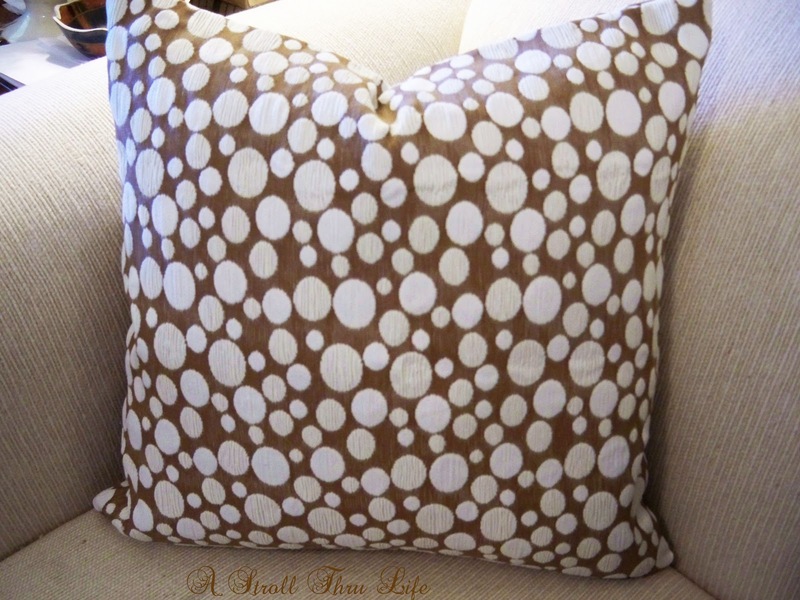 I thought this fabric with the Pebbles pattern was a great one to add to my mix. Works great with the chevron on the sofa and compliments the checks too. Pattern always adds so much interest to a room. I bet I could find even more pattern to use in here. There are 5 different patterns now. You can see the subtle pattern I used on the wicker chair makeover here. Do you like to mix patterns together too? 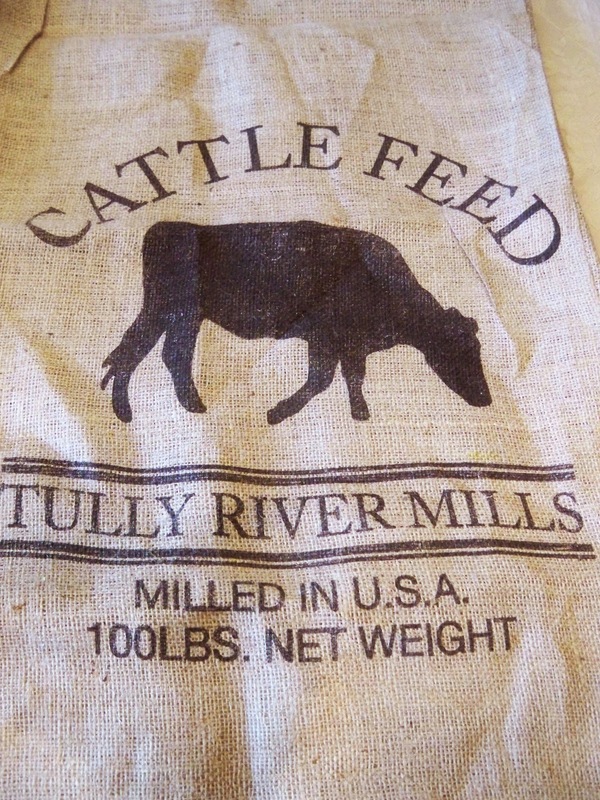 Be sure to sign up below for my French Cow Grain Sack Giveaway. It definitely takes a good eye to be able to mix patterns like that! I am not good at it, but enjoy your beautiful room! Author Phyllis f McManus: I love the way you have mixed the patterns. I have never drummed up enough nerve to do this but after seeing the way you have accomplished the look I am sure I will attempt it as well. Love your mix of pattern! Looks fabulous together! I love to mix patterns too Marty...your pillows look so pretty...love all the fabrics!! Love this room - and whatever you introduce in here seems to be just about perfect, Marty! Well done, ma'am! I love the pebble fabric. It looks fantastic with the other patterns. It's so nice to freshen up for Spring! I just love your fresh prints for Spring and Summer…nice job, Marty!!! Love all the patterns, you have a way of making everything just go together! Marty, love your pillows! I am really crazy about the patterns you've put together, all marvelous choices! It looks great with the other patterns, Marty! I love your new pillow, Marty! 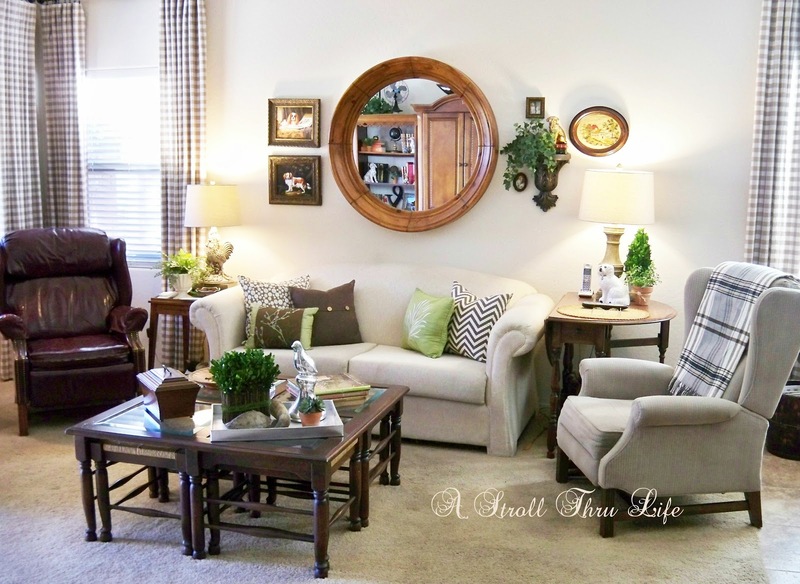 Your living room always looks gorgeous! I do. Patterns make a room come alive with personality! Pillows are my fav ;) lol. 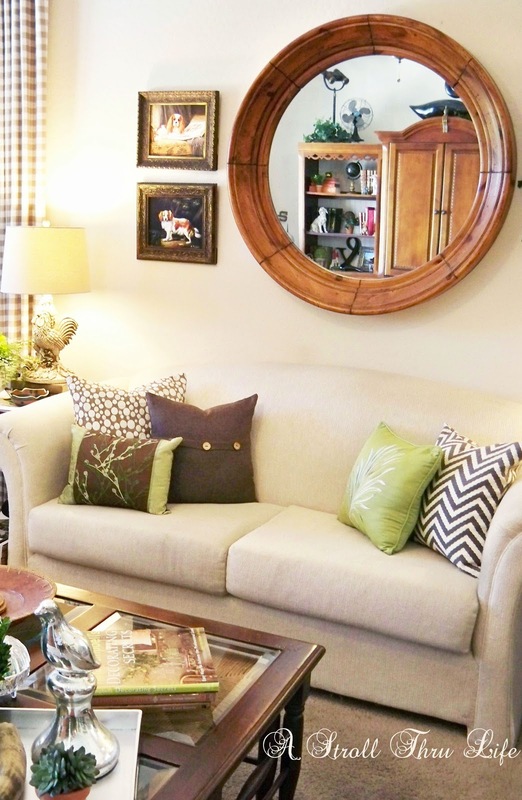 Love that round mirror over the sofa too. That is a beauty! I love mixing colors and patterns. The green is just stunning in your space, what a lively addition for spring! Your living room looks so cozy and inviting, Marty! I love the mix of patterns and textures, and your new pillow is a gem! I LOVE that new fabric!! You are such a talented seamstress! I wish I could hire you!!!! I love ALL the patterns in your family room. Beautiful, Marty! I love all the patterns you have mixed together....very pretty! Marty, you just keep getting better and better....I love the pattern mixes! Very pretty and quite soothing too. I bet it is very relaxing to arrive home to such a beautiful room. I always love how subtle your changes can be but still makes huge impacts on your space Marty! I love to mix patterns too Marty! It looks beautiful!! Love the mix of patterns. Your living room looks fresh and light with just enough contrast. 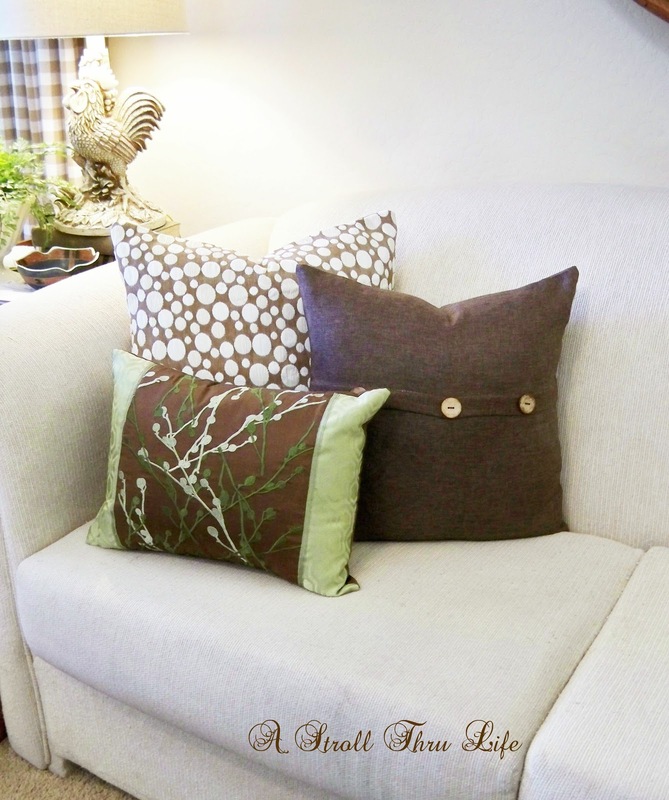 I love the fabric you used for the pillow, it all looks so pretty! 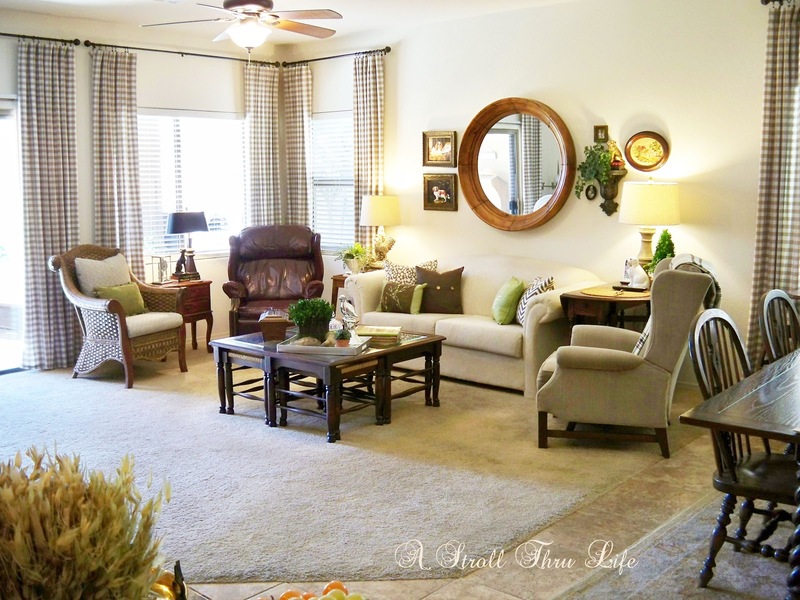 I love the browns and greens in the room.Mixed with the lighter neutrals it looks clean instead of dark and heavy. I'm always making new pillows too! I love how you can change to the total look of the room by changing out the pillows...and you always chose the perfect ones!!! Marty you have such a talent for mixing patterns, I love this room. Very chic and cozy too. Gorgeous!! I just love the texture, the complimentary colors. These are beautiful pictures and inspire me to go get creative!! I really like your mix of patterns and the mix of greens and browns -- so very pretty! I like mixing patterns, but I don't do it so much anymore. I did so much of it back in the early 90's when I had my sewing business. We did some rooms that had as many as ten different patterns, and it looked amazing. I am liking all the chevron that is popping up all over, so I may be adding a bit more pattern......hmmm, just call me indecisive! As long as you are mixing patterns in the same color family, it is amazing how many you can use in one space. Love the newly added pillow. That cow grain sack is so cute! I'm following you in all those ways ;) Thank you for sharing at What We Accomplished Wednesdays. Have a great week! That looks really pretty Marty!